Here is a new take on an old Thanksgiving work horse. It's a little bit of a twist, because it looks like those are sweet potatoes mashed up with the potatoes, but they're not. That's butternut squash in there. And it adds a more complex, savory dimension to the potatoes. Mix in some roasted garlic and a little gruyere cheese and you have an exciting new addition to the Thanksgiving table. This is another one of those dishes that came about by accident. I was making mashed potatoes and accidentally poured in too much cream and butter, so it was quite soupy. I had to think quickly to figure out how to save them when I remembered that I had some roasted squash in the refrigerator for which I had no clear plans. I knew they would mash well so I figured I had nothing to lose. I mashed them up and added them to the potatoes. They turned the potatoes a lovely shade of orange, so it was a little disconcerting as I was eating them because I kept expecting that sweetness that sweet potatoes added. I don't remember what kind of squash it was, but it was a subtle flavor, adding just a hint of nuttiness. It was intriguing enough that I decided it was worth playing with it to see if I could come up with something intentional. This time I thought a butternut squash would work better, given it's sturdier texture and more pronounced flavor. I peeled, deseeded, cubed and roasted it in a little olive oil, salt and pepper. I separated, but did not peel, two heads of garlic and scattered the cloves among the squash. I baked it for about 35 minutes at 350 deg. F., until both the squash and the garlic were soft. The most time-consuming part of this dish is roasting the squash and garlic, and you can do that up to two days ahead of time. After that, it's pretty much like making regular mashed potatoes. But it adds an unexpected, wonderful new dimension to an old favorite so you get the best of both worlds - tradition and innovation. *I usually roast the whole squash and use the rest of it for soup, or a frittata, or some other purpose. Place the cubed potatoes in a pan with salted cold water to cover. Bring to a boil and reduce the heat to low. Simmer for 10-15 minutes, until the potatoes are fork-tender. Drain the potatoes and return them to the pan, placing it over the low flame. Let the potatoes sit for a minute or two to dry. Take a potato masher, a ricer, or a food mill (whatever is your usual process) and mash the potatoes, adding the milk and butter about halfway through. 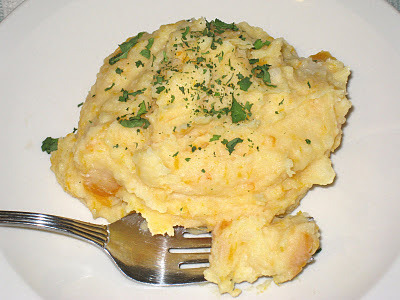 Add the mashed squash and mix it in with the potatoes. Add more cream as needed if the mixture gets too thick. Add the cheese and roasted garlic and stir until the cheese is melted and the garlic is blended in.